I'm a day late. Oops! 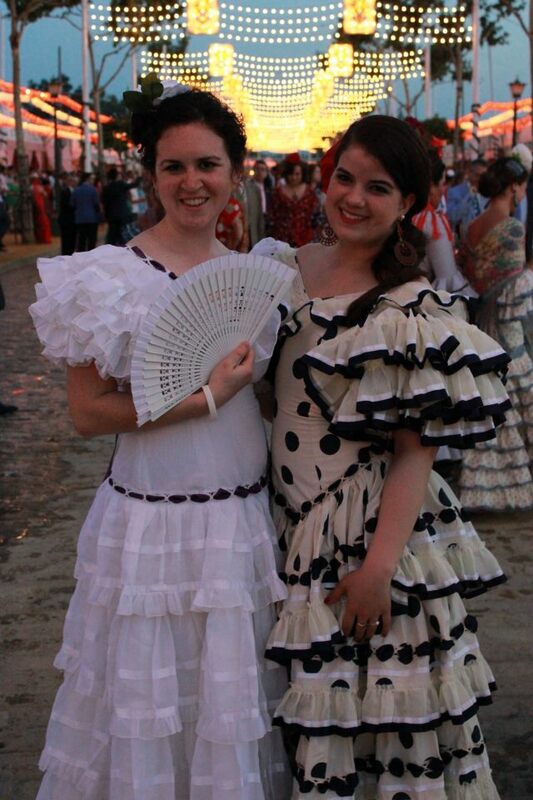 Like many countries, Spain has its traditional national dress. For women, it's the traje de faraleas (a flamenco dress) and for men it's the traje corto (short jacket). Of course, these aren't part of everyday attire. 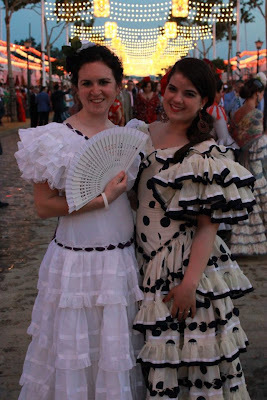 They're worn on special occasions (like the Feria de Abril in Sevilla), and that's about it. 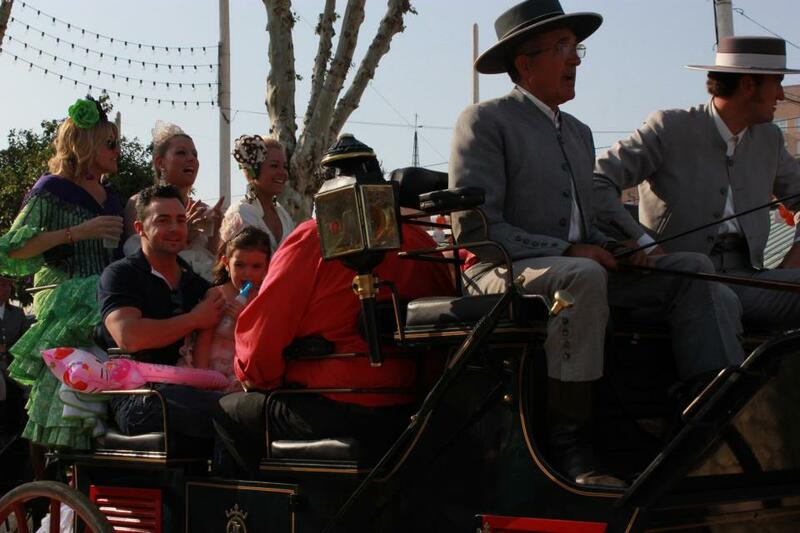 The men are in the traje corto, at the Feria de Abril. Before coming to Spain (and Europe, in general), I received a lot of fashion advice to help blend in, so as to be less targeted by pickpockets. Wear lots of skirts. Don't wear sneakers. Avoid clothing with brand names like North Face, Abercrombie, American Eagle, etc. Not only are harem pants acceptable, but they're relatively common. Sweats are for the house only. If planning to travel to any Muslim countries (such as Morocco and Turkey), make sure you have more conservative clothing and a scarf to cover your hair, so that if you'd like to visit a mosque, you don't have to borrow a head covering. 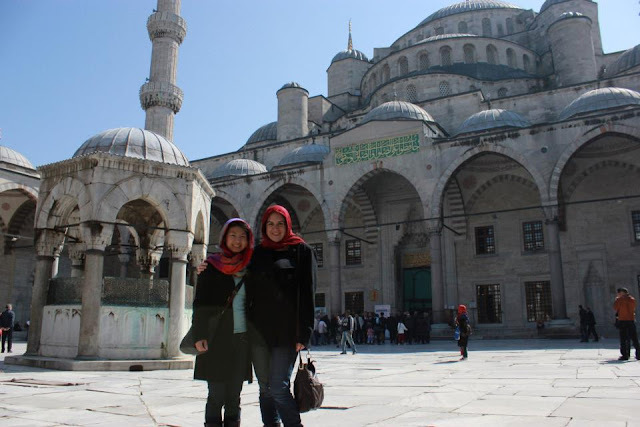 My friend, Natalie, (left) and me (right) in front of the Blue Mosque in Istanbul. We had to cover our hair and take off our shoes before going inside. For more on fashion (specifically, fashion in writing), click here!